Excel stats, graphs and data turned into a slick presentation. We are uniform and equipment manufacture/supplier. 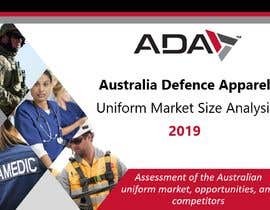 We have recently pieced together a large amount of info to gain a better understanding of our addressable market in Australia and identify where we might find opportunities by sector and by client - we’ve also taken a closer look at our competitors. The data is in raw excel form (approx 5 tabs) and using basic excel charts and formatting. We would like this crude data used to create a sleek, professional presentation - PPT or equivalent. #extended Would you consider to extend the contest for a few more days? I think i can come up with something better. I will assume "To be confirmed"?? could you please let me know what TBC stands for in the competitor profile data? Thank you for the interesting assignment, it was great to work on the same. i have submitted my work (entry #61). look forward to hear from you. Hi there, I am working on this contest. Just want clarification on 1 fronts: 1) What is competitor 'TBC' full form? Please, don't close contest yet, I am going to submit an entry, working on this. very interesting contest. do you have certain questions in mind that you need to be answered using this data ? Kindly take a look at No 2 you will surely like my work. Hi, Can you please check entry number 18. Would be great to have your feedback. Thanks. Please check entry #5 feedback is appreciated. Kindly check No 2, i can make it look more concise and brilliant.